You know you’re getting old when you can remember and refer to life ‘before the Internet’ (B.I)*. Grant it, only 12 years of my life were spent in those Dark Ages. As child, I liked the feeling of thinking I’d come up with something amazing, creative and original – and that nobody else in the world had ever conceived such a thought before me. Now whenever I come up with something mildly amusing all I have to do is a quick Google search to have my anticipation dashed. Someone (usually many someones) have already thought of it before me and had the capacity to post it on the Internet for the world to see. The notion that there can no longer be an original idea anymore, came to me last year at work. 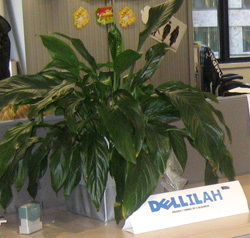 My desk plant, a Madonna Lily had been christened with the name ‘Delilah’ by a colleague. Being in IT, nerdy and such, I made a name sign for it using a version of the Dell logo that I photoshopped. It was original and I relished the wittiness of it from anyone who was geeky enough to ‘get it’. But not to stop there, I moved another plant next to it and called it ‘Samsung’ using the Samsung logo as a name tag for it. So now we had Samsung and Dell-ilah. *boom*tish* For those not getting it, check out the Biblical story of Samson and Delilah. I thought it was genius, I couldn’t wait to post it online and lay claim to such originality. I googled it and found a multitude of sites referencing it, even an unmotivational poster. I was robbed of my moment of glory. It begs the question, how many people have also thought of similar ideas and not had the knowledge or resource to make it available online? Hundreds, thousands? I’m sure that it’s no different to the early/mid 90’s when I was laying claim to all manner of brain wave ideas and inventions, yet at the time I and nobody else had any way to prove otherwise. I kind of miss that blissful ignorance. *B.I acronym for Before Internet has sadly already been thought of.